The Kai 7240AS Shear is specifically designed for Aramid fabrics, and can even cut through Kevlar! 9.5" in length , designed for ambidextrous use, and has a serrated lower edge to prevent fabric slippage. The KAI 7000 Series™ High-Carbon, Stainless Steel Shears are not a reinvention of the standard cutting implements—they are the next class of professional, must-have scissors. Designed to professional standards, these tailoring-style shears are perfect for clothing construction, perfect pattern cutting, and much more. 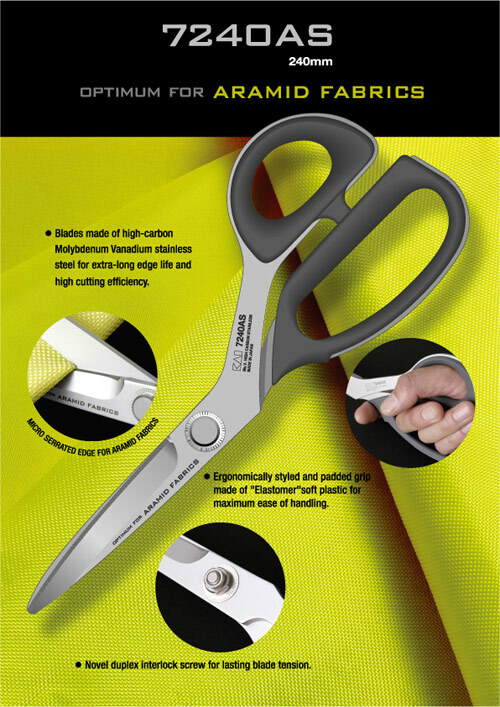 Smooth cutting action, super sharp blades, and a comfortable fit make these the sharpest, most ergonomic fabric scissors available. The entire shear is cut via laser out of high-carbon, maloybenum and vanamium stainless steel. What does this mean to you? This process, and these materials, ensure long-lasting sharp edges and a perfect balance. Equipped with a patented double-nut interlock blade fastener, the blades are designed to prevent the common loosening screw, maintain tightness of the tool, and adjust the blade tension. Furthermore, the shears present an elegant matte finish, and come with a tasteful elastomer cushioned handle, molded to fit your fingers for a perfect grip—just like the majority of their products. The winner of the 2005 IF Design Award, the shears are designed for all types of fabrics, such as acrylics, sheers, denim, silks, canvas, dacron and composite sail cloth, leather, fleece, culinary use, drapery fabrics, and upholstery.